Suit and tie make it all business in the day and then happy hour strikes! Pronounced as Brick-uhl, this neighborhood is Miami’s financial district and residential hot spot. Everyone and everything here is dressed to impress! Financial towers, luxurious condos in high-rises, Metrorail that moves above ground level and Miami’s ocean and river front set up the stage for Brickell. However, it is not all business here. Brickell has its serious business reputation while keeping the “Miami” feel alive. People (especially pet-owners) who like living on the edge in a fast and happening environment will find themselves at home in Brickell. Brickell is a perfect residential hub for professionals working in the neighborhood or close by. The living experience calls for high-rise condo, apartments and waterfront lovers. People who prefer living in homes with a back yard and front yard should stay away from Brickell neighborhood since houses are not an option in this neighborhood. 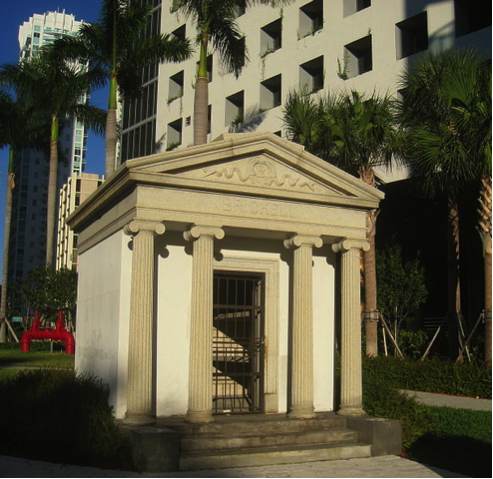 Brickell came to be known as Millionaire’s Row in the early 19th century with lavish mansions being built along Brickell Avenue. Famous celebrities like Jennifer Lopez, Marc Anthony and the likes have a home in Brickell. The tallest building in Florida State is the Four Seasons Hotel and Spa and is located in Brickell. The Viceroy Hotel and Icon towers lobby was designed by the famous designer, Philippe Starck. The park at 1814 Brickell Avenue hosts a memorial built in dedication to 9/11 and is created from one of the last remaining steel beams unearthed from the ruins of the World Trade Center. Some call living in Brickell a dream with all that the neighborhood has to offer- the high-end lifestyle, outdoors by the water, exclusive restaurants and boutiques, being a part of the financial hub and a great nightlife which ranges from calm and quiet to party all night long. Brickell has Downtown to its north, Coconut Grove to its south, Little Havana to its west and Biscayne Bay to its east.Public transit is possible, easy and inexpensive. Having a car is easy although parking can be a hassle. 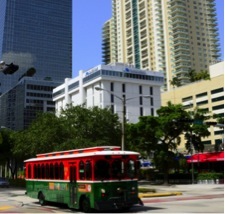 Public transportation is vital to life in Brickell used more than in any other part of Miami. 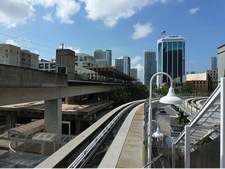 The Metrorail and Metromover are free within Brickell neighborhood and connections to other neighborhoods are fairly inexpensive. Stations are conveniently located at almost every two blocks. 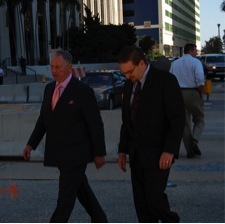 Life in Brickell is pedestrian friendly and a car-free lifestyle is commonplace. Taxis can be found with ease in Brickell especially after midnight when the Metromover stops. These attributes make “Manhattan of the South” an apt reference for Brickell. During the day traffic moving towards Brickell is heavy with many businesses located in the neighborhood. For people moving away from Brickell to work, congestion is not a problem. 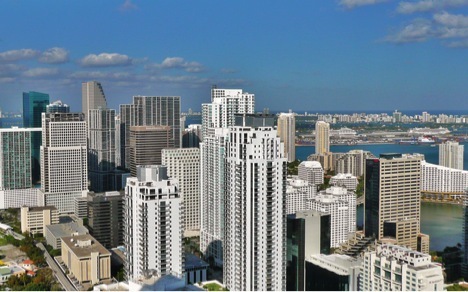 Brickell has connection to US-1, i95 and other major expressways within a 3 mile radius. 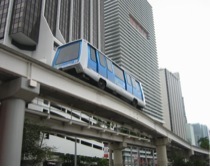 The Miami International Airport is an easy commute of about 15-20 minutes’ drive from Brickell. “Manhattan of the South” is a good way to introduce Brickell. Fast-paced and buttoned up during the day and relaxed after the closing day, Brickell carries the business and the residential world in its stride. Skyscrapers make for business, condos and luxurious hotels. Convenient means of public transportation, cafes, bistros, restaurants that offer great business lunch spots and transform into chic venues as the night approaches make Brickell a prime catch. Work hard and party harder in Brickell! With rapid urbanization over the past few decades, Brickell has new tones to its original character. Historically built mansions have given way to high-rises all over. Very few buildings have retained their original, historic architecture. 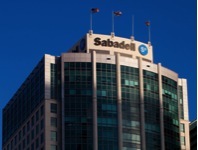 Recent developmental plans indicate rise of commercial centers and further looming towers. 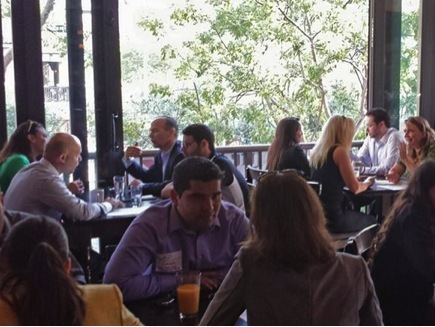 Young professionals, students and tourists form the majority of residents in Brickell. Families can also be found here in small numbers, however generational roots are scarce. 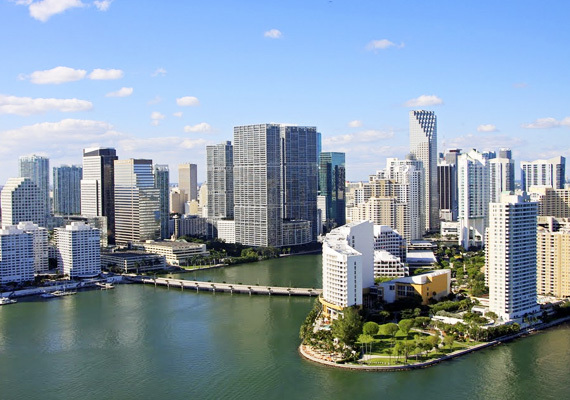 Brickell boasts of a few high schools and Florida International University and other universities have campuses located on Brickell Avenue. 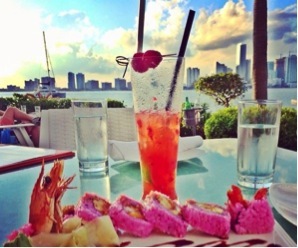 Brickell is home to some of Miami’s exclusive restaurants, boutiques. 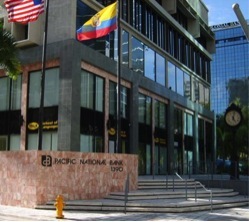 Internal banks and consulates are headquartered in Brickell. Surprising though it may seem, Brickell also has a few parks, some of which are natural preserves. 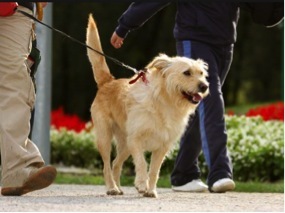 Pet-owners can find themselves completely at ease in Brickell. The high-rise buildings have liberal pet policies and being a pedestrian-friendly neighborhood, walking a pet needs no thought. Brickell residents can enjoy various activities like walking, jogging and bicycling while enjoying the view of the water, the bustling streets or greenery of the parks. The apartment buildings all have strategically located pools on high floors for the residents to enjoy a swim or a tan in the Miami weather all year long while enjoying the view of the skyline on one side and dazzling waters on the other. The day starts early in Brickell for many- joggers, runners, bicyclists and pet-owners can be found starting off their day with sunrise along sidewalks by the high-rises and water. 9-5 is a different beast in Brickell. The work day witnesses professionals briskly dressed and in their work mode. Glimpses of these professionals can be seen as they step out on business or during lunch hours. Lunch hours in Brickell portray professionals and tourists spilling out on the sidewalks for either quick take-outs, relaxed lunches or power breaks. During the weekends, lunches in Brickell take the form of relaxed brunch styles. The cafes, bistros and restaurants in Brickell modern, chic and offer a variety of world cuisines. The places have great food, shaded outdoors and are within walking distance from any office location. So the options are plentiful. 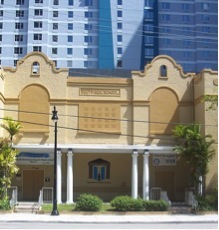 Mary Brickell Village is a two-block long community of restaurants, boutiques, bars, cafes, and clubs along the Miami Avenue. The area is always happening with people at any given hour or day. 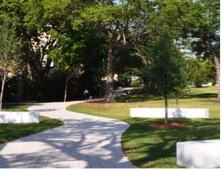 The parks in the Brickell neighborhood are open to public and are easily accessible. Tourists and residents can enjoy the water with activities like boating, paddle-boarding, kayaking and jet-skiing. For people who would like to stay within the building space, the swimming pools offer a chance at relaxation or exercise with a tan and a view! The closing bell changes the atmosphere in Brickell. Formals come off giving way to every form of an evening out. Happy hours find buttoned up people sitting down for drinks and a relaxed evening. Some people put on their running gear to begin their evening with a walk or run or time with a pet or just to sit down by the water for contemplation and an outdoor experience. As the night progresses all kinds of night birds find their way in Brickell. Quiet, cozy restaurants and cafes make for date nights while bars become hangouts for game nights. Classy, elegant and dressed-up is pretty much the style of Brickell. Mary Brickell Village acts like a magnet for Brickellites as the sun starts setting. Mood lighting and outdoor sitting are dinner favorites. Drinks and spirits are on a high in the culturally different bars – from American, Cuban, and Mexican to Irish, drink up to your taste buds. 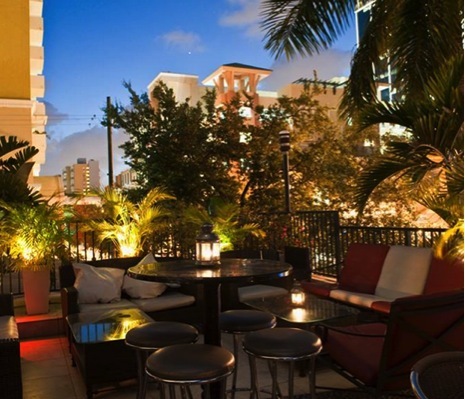 For party lovers, Mary Brickell Village has many clubs that will get you dancing into the wee hours of the morning. Stepping off the Brickell Avenue opens doors to outstanding ocean view. The water in all its glory with Brickell in the background is a view that will leave you wanting more. 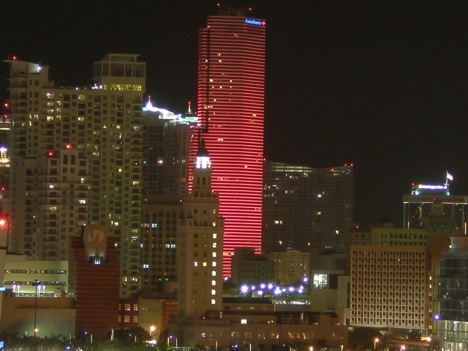 A landmark office skyscraper of Miami, the Miami Tower is a sight worth-seeing from Brickell. At night, the entire building is adorned with illuminations and during the day the sight is complete with its dramatic three-tire glass construction. The tower has multiple color schemes that run in tribute to different seasons and holidays. If Brickell is the “Manhattan of the South”, then the Miami Tower could well be considered the Empire State Building of Miami. Located on the east side of Brickell Avenue, the Viceroy Tower or The Viceroy as it is better known is a short tower with the Viceroy hotel included in it. The lobby of the tower is well known for its luxury and design. What makes the tower special is the panoramic view of downtown Miami, Key Biscayne and South Miami Beach from the rooftop lounge. The view is simply breathtaking no matter the time or day. 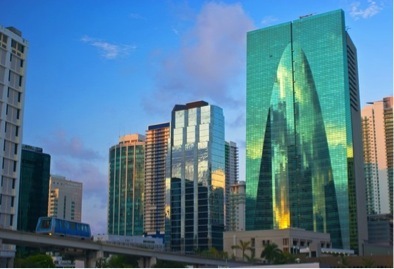 To experience Brickell in its entirety and to enjoy the “Miami” feel, a visit to Mary Brickell Village is a must. The Village is setup in a French design and is welcoming all through the year with its boutiques, restaurants, pubs, clubs and glamour.